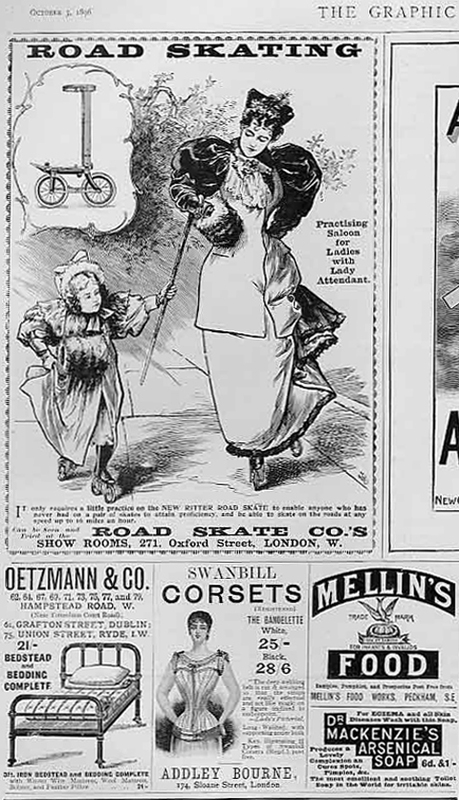 Ritter Road Skates were all the rage in the late 1890s. This pair of Ladies’ Ritter Skates, size 10, are in good original unrestored condition. You can see the remains of their original leather straps. Some enthusiasts like their Victorian treasures to be ‘as found’ and unrestored, while others prefer a renovated appearance. Reproduction reproduction leather straps are easy to find (I’ve included a photo of some suitable straps at a cheap price further down the page). The boots can easily be hand-painted in matt black and new straps fitted if a restored appearance is required. 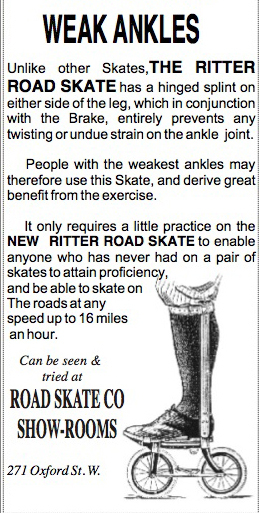 Ritter Road Skates were not originally sold with boots, but I have added a suitable pair of leather boots, as seen here. This pair of historic road skates is to be sold with the boots illustrated, and also a copy of the famous Ritter Road Skates poster. The skates have been marked ‘L’ and ‘R’ in chalk. Hove Museum (at 19 New Church Rd) is a charming place, with friendly and helpful staff, an eclectic array of artefacts, and a decent cafe. Well recommended if you’re in the area.